I don’t care what you might say about my ancestors coming from the seering savannahs of Africa, it’s been too damned hot for too long around here. Ronni doesn’t like air conditioning and she hardly ever turns it on. 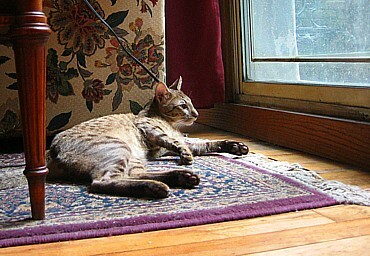 I know it’s my job to keep the birds from breaking through the screen door to attack Ronni, but too bad, she's on her own. The best I can do in this heat is lie here and hope. It was hot last week, too, when Ronni unceremoniously dropped me off at David Baird’s place and then left for six whole days. I was so mad, I sat on David’s cowboy boots in the back of his closet for the first two days and wouldn’t come out. After the second night, David grabbed me by the scruff of my neck and dragged me out. I was really hungry by then, so I had some crunchies in the kitchen and then I found some of my favorite toys from home scattered around the living room and it felt good to stretch my muscles in a good romp chasing a few mousies and some cellophane. 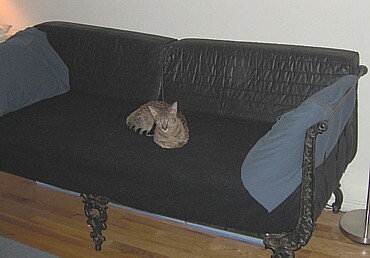 Then the heat got to me, so I settled down on David’s excellent, black sofa that nicely shows off my spots. If I’d realized how good I look there the first day, I wouldn’t have hidden in the closet for so long. Something big is going on around here and I don’t like it. For two weeks before my trip to David’s house, there was this guy, Jimmy Flynn, who scattered all kinds of tools and equipment around the house. I had to guess where my litter box might be every day because Ronni kept moving it to different places while Jimmy pounded and banged and painted and stuff. Geez – it was so noisy around here, I couldn’t have a decent afternoon nap. And now that she’s home, Ronni has stuffed me in my carrier (Note to Ronni: I need a new carrier – I’ve almost outgrown this one) three times and taken me out for a couple of hours to someone else’s house. She says it’s because people are looking at our home to see if they want to buy it, but don’t you think the house would be a lot more attractive if there were a cat as beautiful as I am showing them all the good places there are to stash their toys? I'm not very clear yet what all this "selling the house" means for me, but the way life is going around here lately, it probably won't be to my liking. The only positive thing I can say about it all is that both Jimmy and David are good guys. 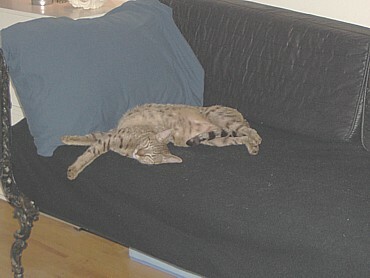 They know how to appreciate a cat like me and snoozing on David’s sofa is almost as comfy as the pillows on Ronni’s bed. But basically, I’m one pissed off cat. Strangers poking their noses in all my nooks and crannies, too much noise, too much heat. And worse, Ronni says she’s going away again at the end of July. The fear of death is as old as human consciousness and it is a powerful deterrent to doing stupid things, on our way to the grave, that might kill us before our time. Still, few like to be reminded they are mortal and although it is rarely acknowledged, much of the ageism and age discrimination evident in U.S. culture must be attributed to that most primal of fears. Old people remind others that they too will wither and die one day, so elders are often made outcasts – ignored, sometimes vilified for being greedy geezers, fired from their jobs before younger workers, and urged into retirement villages where they are isolated from the general population. No wonder everyone is afraid of getting old. It is an enormous relief to have lost concern for my appearance which afflicted most of my adulthood. Now, “I yam what I yam,” as Popeye said, and at 64, I really mean it. I’m invisible to men these days, but the need to be noticed in a sexual way is gone with the waistline. Do I wish my face hadn’t got so pudgy in my old age? Well, yes. But I had the misfortune to be behind the door when they were passing out those gorgeous facial bones that give women like Katharine Hepburn such an attractive old age. And them’s the breaks. It’s okay. Although my nature will never allow me to reach the Zen-like state of equilibrium I aspire to, my patience and tolerance have grown a great deal in just the past five or six years. Sometimes, now, I recognize when an argument is pointless and I can walk away from it even when I think I’m right. If I can’t shrug when things don’t go my way, at least I don’t require myself to be stoic and pretend it’s all right anymore. When I lost the bid on the home I wanted in Maine last week, I cried. I even wailed a little. Sometimes bad things happen. In old age, I know to grieve for awhile, to feel the pain and then get on with Plan B. More genuinely than in my youth, I can be pleased for another’s accomplishments even when they impinge on my beliefs about my talents and capabilities. I’ve stopped comparing myself to others. And nowadays, I eat ice cream, only ice cream, for dinner when I feel like it without a twinge of guilt. The most interesting thing about these changes is that they have happened without effort. They came along little by little on their own and I noticed most of them only in retrospect, after they had become part of my being. To younger people, these may not seem, now, to be just compensation for a wrinkly face, limited energy and the aches and pains of old age, but they are infinitely more satisfying than the transient benefits of youth - or at least they feel that way. And the best part is that everyone, no matter how afraid they are of getting old, will find these and other rewards waiting for them when their later years arrive. The important thing is to appreciate each era of life in its time. According to the media and those who market to older people, no one retires these days. Instead, they become “active adults” when they stop working full time. What is defined these days is longevity. We live longer and healthier lives than previous generations and there is no reason, for the majority of boomers who say they want to keep working past 65, to do so except for corporate America’s distaste for gray-heads in their offices. This time of year is layoff season at corporations and anyone past 55 and even younger had better do everything they can to hang on because it will be an uphill battle against age discrimination to find another job. Many of them, like me, will find retirement – or, in the current parlance, active adulthood - forced on them. Retirement, even in recent years, is not a concept I had contemplated. It conjures up for me visions of golf courses and swimming aerobics under the unrelenting heat of the desert sun in what the housing industry calls active-adult communities and I call old-age ghettos. They may work for some people, but I can’t think of a better way to become the cliché of a hidebound geezer than living in what is, essentially, a gated community of like-aged and like-economically-situated residents. That will come soon enough if one day it becomes necessary to move to an assisted-living facility. Meanwhile, I have not been able to define retirement for myself. I didn’t expect to stop working full time until I made the choice, and once I’ve completed the move to Portland, Maine, I’ll be looking for ways to enhance my income. This blog will keep me busy too and in a couple of weeks, I’ll begin writing regularly for another website. Also, there are all the things I want to know that I had no time to pursue during my working years. Boredom is not in my future. In the U.S., we are each defined to the outside world primarily by our jobs. One of the first questions on meeting new people is, What do you do? And I no longer know how to answer that question. It may be vanity or prejudice based on faulty, past perception, but “I’m retired” is not a phrase that will pass my lips anytime soon. Others’ impression of me, however, is not what is important. How I characterize my new circumstance to myself is. For nearly 50 years, my days have been framed by my working life, by travel to and from my place of employment and by the titles radio producer, television producer, web editor appended to my name. There is a conversation going on at David Wolfe’s Ageless Marketing about why advertisers spent so few dollars targeting the over-50 crowd. They must be spending their TV hours with Nickelodeon because on the channels I watch there are a whole lot of arthritis, constipation and erectile dysfunction commercials – not products aimed at the youth market. There is an abundance of marketing targeted to older folks, although it is all generally negative, as if people older than 50 have no interest in anything but bodily malfunctions. Ignoring those, however, older people are marketed to all day and night on television just like everyone else. Age doesn’t matter in regard to household products, automobiles, food, cruise vacations and cell phones. And for that, the advertising industry which uses models and actors from a variety of age groups to hawk all kinds of products, deserves applause. Marketing appears to me to be one of the few areas of American culture that is age neutral and I’m not so age chauvinist as to ignore a car commercial just because the vehicle in question is being driven by a gorgeous 20-something. At the same time, I suspect that no college kid in need of a telephone service ignores Verizon just because pitchman, James Earl Jones is 70 years old. We do a lot of complaining about ageism here at TimeGoesBy, but it’s hard to make that case against marketers; it is the products that too frequently don't suit older people, not the advertising. As is the idea that older people deserve a separate marketing category. Certainly there are products designed to appeal to differing age groups and advertisers appear have mastered the art of targeting those quite well. For the rest of it – what is it they think I don’t appreciate, at my advanced age, about the Geico gecko? On our trip down the northern coast of the U.S., Elsbeth and I stopped to visit my brother, Paul, who was living then in Astoria, Oregon. I could be wrong, but I believe this is one of only two or three photos of us together - and not a good one - since we were kids. 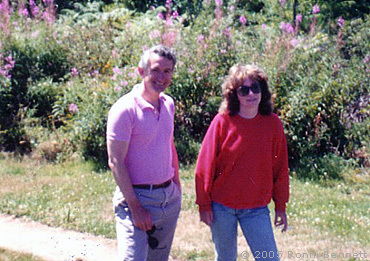 Elsbeth and I began our northwest trip in Victoria, B.C., a town where my parents, in the late 1930s, had courted. 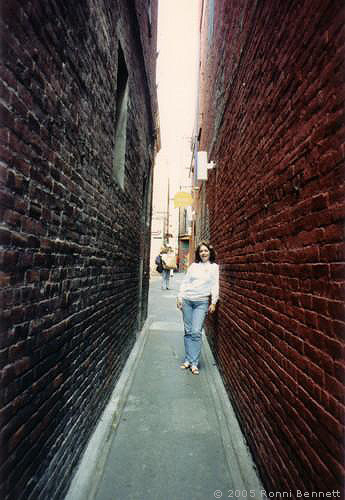 I like thinking that perhaps they walked hand-in-hand down this alley then. There is a little post about my first day in Portland over at A Sense of Place. [November 1987] On the weekend my former next-door neighbor, Elsbeth, held Thanksgiving at her new home in Virginia, there were guests from five U.S. states and two other countries. Elsbeth and I made a pact to exchange personal tours of our childhood homes – Oregon and the Swiss Alps. So far we’ve only done Oregon. You can swing by and see me in Lyon when you take that long overdue trip to the alps - with or without Elsbeth. By all means take the trip to Alps. 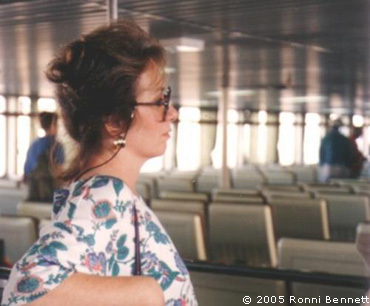 I love this photo of you, Ronni. Great and unguarded. Your log is so masterful and sure. Thanks loads for your comment on my beautiful parents. I agree. And it’s very nice to have this pair of photos to remind me that they were lovely then, at the leading edge of their dreams. What a direct & fearless gaze. [November 1987] I’ve always been impressed with how every immigrant to the U.S. I’ve known – people like my friend Elsbeth, who are unlikely to have portrayed Pilgrims in grammar school pageants - embraces our most American of holidays. She must really like turkey. The turkey almost looks happy too. In an odd way as an immigrant she is a pilgrim of sorts. I am a born and raised American although I have never hugged a turkey quite like that. Nice memory. She needs to wash her sweater...er, boil it. Embracing the holiday doesn’t REQUIRE embracing the turkey, I hope she knows. Great, its hug a turkey before you cook ‘em day. She looks like she is dancing with it. By the way, Canada has Thanksgiving, too. 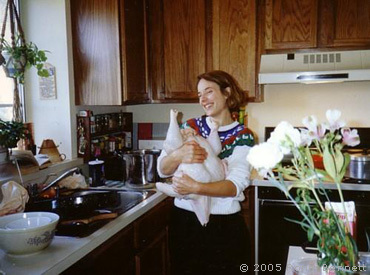 I have hugged a few turkeys in my days - and some of them were human! We humans like new beginnings, the chance to start over. We make resolutions on New Year’s Day and whether we keep them or not, we enjoy the idea of a clean slate, the opportunity to do things better in the coming twelve months. Birthdays hold the idea of a clean slate too, along with graduations, new jobs, marriage, even divorce and – a new place to live. On Sunday, I go to Portland, Maine for most of the week to find a new home to buy. The decision to leave New York, forced on me by circumstance, was made six weeks ago and since then, in the busy-ness of preparing this home for its sale, I hadn’t realized until a few days ago that this move is a new beginning for me. Looking back, it appears that I’ve made it a lifetime career to start over. I left home at age 16, one week after graduating from high school. I married and then I divorced. I’ve had four careers, starting at the bottom of each one, whatever my age. I’ve lived in six cities, liking some better than others. And now there will be a seventh. But today, I’ve got a giant case of the can’t-waits. A whole new city to discover. Different customs, sensibilities, ambience, rhythm of life. Every place, large and small, has its singular myth and to maintain a cohesive culture, everyone living in that place must buy into the local myth which affects politics, schools, building codes, transportation, elections, how taxes are spent - everything. I won’t find the answer in one week of house-hunting, but this trip is the beginning of my new beginning. And I can’t wait. Dr. Thomas was referring to the warehousing of elderly in nursing homes and assisted living facilities, but long before old people are ready for that indignity, they are made invisible in dozens of small ways every day. After a certain age, these invisible moments come ‘round more frequently. Waiting on line to buy a toasted bagel recently, the counter kid’s eyes passed right by me to the next man as though I wasn’t there. It’s not the first time it happened and it won’t be the last. “I know what you mean,” said the old man. Mainstream newspaper columnists seem to be having an off week. John Tierney of The New York Times did a lazy job in his column yesterday on Social Security, and Abigail Trafford at the Washington Post was a letdown too, on the same day. “But what if the ‘they’ in such a quote were African American postal workers? Sooooo slow! Or girls in algebra class? Sooooo slow! “Geezer-bashing is socially acceptable….Chronological diversity is not regarded as part of cultural diversity. All important points we’ve been making at TimeGoesBy for more than a year now, but by sandwiching them between several paragraphs of what is a minor, ageist indignity about the driving habits of older people when there are so many serious consequences such as employment and healthcare discrimination, Ms. Trafford diminishes the issue and comes dangerously close to making ageism a joke. It would be good if Ms. Trafford, in her unique position at a wide-circulation newspaper that gets more attention than this little blog, would assert a bit more muscle on issues of aging than she does in this column. There are thousands of newspapers online and it is one of Crabby Old Lady’s pleasures to skip around among them, especially the editorial and op-ed pages, to see how the national debate is being set. A few newspapers are more equal than others and therefore more important to read to be an adequately informed citizen. The New York Times is one of that handful because leaders and policymakers worldwide read and are influenced in their decisions by those pages. It is therefore incumbent on those newspapers to be more fully accurate and to tell the whole story. Today, The New York Times fails egregiously – as they regularly do on the topic of Social Security. John Tierney, who recently joined the paper’s roster of op-ed columnists, lobbies in his column for raising the retirement age as a way of tweaking Social Security. Crabby thinks this is a good idea, but in making his point, Mr. Tierney accuses old people of being lazy in not working longer than they do. No, they cannot, Mr. Tierney. They took early Social Security out of the necessity to eat regularly because once laid off, no one would hire them. For Mr. Tierney (and other reporters on this topic) to assume laziness in elders is lazy reporting. Let Crabby explain. Anyone who collects Social Security at whatever age is counted as retired and are then no longer counted in the monthly unemployment numbers from the Bureau of Labor Statistics which thereby show older people as more fully employed that some other demographics. That is one way statistics lie – when raw numbers are given unwarranted explanations on whim and bigotry to support a partisan political agenda. Every survey about retirement in the past three or four years reports that older people in large numbers intend to keep working beyond age 65 and even 70. Where, then, is the survey of early Social Security beneficiaries that asks why they took the benefit at 62? What about the struggling old people, Mr. Tierney, who have spent a lifetime paying for their elders’ Social Security without complaint and whom you are now vilifying as greedy old geezers? If the retirement surveys mean anything, old people are willing to work longer; they are just not allowed to. Until there is a survey asking why the majority take early Social Security, to report that old people are lazy is irresponsible journalism at its worst on the part of Mr. Tierney and The New York Times. It's been too dog-days-of-August kind of hot in New York City for too long and there still too much to finish today to prepare the apartment for real estate photos Tuesday morning to do any blogging. But over at A Sense of Place there are some photos Gordon Coale asked about last week. [September 1987] One night in southern Spain where we were shooting an interview with Sean Connery, I stuck three pesetas – then the equivalent to about 50 cents - in a slot machine at the casino and out poured a stream of coins that, when counted, were worth about US$4,000. Found money! So I splurged for an additional week at the tony Marbella Club, visited the Alhambra in Granada and took this boat across the Strait of Gibralter for a couple of days in Tangier. It’s stories like this one that keeps the slots of the world busy. This makes me grit my teeth that nothing like that ever happened to me. Hmmmm. Not quite enlightened yet. Anyway, glad it happened to SOMEBODY. Oh, what a great story. I do believe Sean Connery must have brought you this luck! Sounds like a great time! I have lived here 4 years now and STILL haven’t taken the ferry! I swear I’m doing it this year. I met Judy when we were both producers at WMCA Radio in 1968. She moved on to establish her own publicist’s business specializing in big-name authors, and her press parties are always glamorous affairs. Eight years after this one, I produced a profile of Dunne for Fox News which, I believe, never aired - Roger Ailes had not been hired yet and Fox had not yet found its, uh, footing on television. 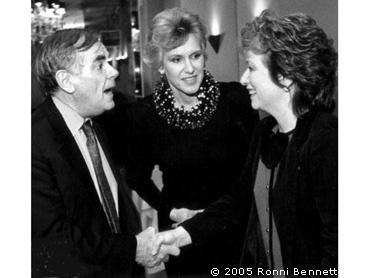 Hi Ronni, I remember Dominic Dunne. His articles in Vanity Fair, his murdered daughter. Very sad story. Yes, Dunne, interesting articles on the Menendez Brothers too, fascinating. Love, love love this history of yours (and our times). That’s a researcher from one of two new studies reporting that older people are not as grumpy or crabby as they are thought to be, and they are also better, according to the studies, at getting along with others than young people. It’s been almost three weeks since Crabby Old Lady mentioned Social Security privatization and you’re probably not unhappy about that. Nevertheless, it’s time for an update. “If you're a police officer and a nurse, who started working in 2011 and you work your entire careers, when you retire both of you will have a combined nest egg [from private accounts] of $669,000 as part of your retirement package. That's how money grows. Where does this guy get his numbers, Crabby wants to know? Markets go up and down; nobody can predict their return over time. But the public seems to understand that. The more Mr. Bush talks up Social Security privatization, the less people like it. In addition, they are nervous about the economy: Consumer confidence is down, the inflation rate was up to 3.5 percent in April and the Dow is down 300 points since the president first took office in 2001. Also, pension funds are crashing left and right. “We’ve become increasingly a risk society, where you’re transferring all the risk onto the individual,” says Karen Friedman, policy director at the Pension Rights Center in Washington. Mr. Bush seems to be losing interest in Social Security. Congress is involved with judges and filibusters, and the news media is mostly ignoring the issue. Crabby Old Lady is hoping the president will drop the phrase “personal accounts” into the same hole where he put “track down bin Laden dead or alive,” and then Congress can address the simple tweaks the system needs and get on with the really big problem – Medicare. It’s not the cultural pressure on elders to behave and look like younger people or even the overt age discrimination in the workplace that marginalizes old people. I am coming to believe that these indignities would not exist if it weren’t for the indiscriminate ageism that permeates media in all its forms. It is so common and so subtle, it can even appear to be complimentary. Of course, this is a common conceit among many who write about books in the popular press – that we mere readers of any age (on whom, ironically, they depend for their livelihood) are too dim to have read or, if we have, to have understood anything more complex than genre fiction, let alone write it. The undertone of the entire review is dismay at Chadwick’s accomplishment at such an advanced age. The piece is titled The Kid is All Right. The cutline is “A 72-year old civil servant pens a brilliant first novel” - both insinuating that Chadwick is an anomaly: how amazing that an "ordinary man" in his eighth decade is capable of writing a book worth reading. Why shouldn’t someone with 70 years of life experience, some talent for words and the distinct possibility of possessing a bit of wisdom be published for the first time without surprise? I’ll read an old person’s first novel long before any of the hundreds of unripened 20-something first-timers who are published each year. This review is an example of the kind of subtle, off-handed ageism which, if you read as much about old people as I do for this blog, becomes apparent every day and in its ubiquity, supports the belief that all but a few old people are defective in some manner. 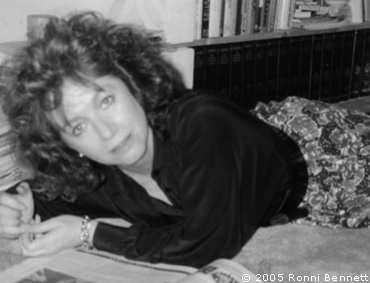 “Here’s a line from another ancient song, When You and I Were Young, Maggie: ‘My face is a well-written page, Maggie, but time alone was the pen.’ People used to say: ‘I earned these wrinkles.’ Why isn’t that ok anymore?..." Me too, which is pretty much the entire reason for TimeGoesBy’s existence. But it’s an uphill battle to make being old, looking old and enjoying growing into elderhood acceptable. It wouldn’t be a bad thing to be treated as “old” if the culture didn’t, at the same time, treat aging as a defect. The greatest compliment adults believe they can bestow on an elder is, “Oh, you don’t look that old” or “Oh, you don’t act like you’re that old.” I’ve often been told both and I resent it. I've earned these 64 years and I want to be what I am now without feeling there is something wrong with me.